The folks at Jo-Ann Fabric and Craft stores are at it again. They challenged bloggers to create holiday DIY’s using supplies from Jo-Ann, and based on a secret theme that would be shipped to us in the mail. Halloween is my favorite, so of course I was in! I was really excited and surprised when a big box of mixed supplies from Jo-Ann arrived with my theme. I’m still thinking about projects for all the goodies they sent-so more DIY’s to come. The theme for this DIY was “spooky spaces”. I tried to think about spaces that can some times be over looked when decorating because you might already have a lot going on in those areas (like the kitchen or bathrooms) and some times knick-knacks might get in the way. I finally settled on kitchen and decided to create a spooky paper towel holder. Both Halloween decor & functional. My first stop was Jo-Ann for the supplies…. Paint-I went with Martha Stewart brand because I really like how it actual goes on with one coat of paint. I chose black, white, and orange. Crackle-I haven’t used a crackle medium since I was a kid and I remembered it being kind of messy and involving two products, but this stuff (also by Martha Stewart) is one product and really easy to use. It is also so much fun for kids (yep adults too) to watch the paint crackle. dowel rod– I purchased the largest circumference rod that my Jo-ann had, and cut it to about 11.5 inches high. Most paper towel rolls are 11 inches tall. 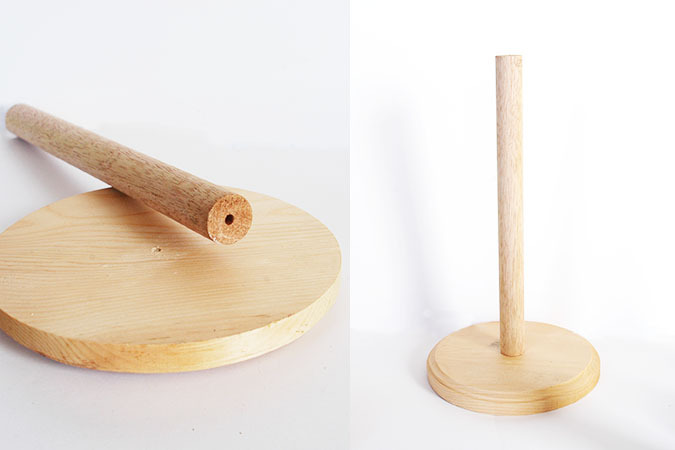 Wood wheel– This came in a bag set of 4, and works as the base for our pumpkin head. Paper Mache Pumpkin-these were on sale right now and also come in a set of four, found in the Halloween area. Glue-I used a basic all purpose glue, but you could use wood glue, or epoxy. 1. 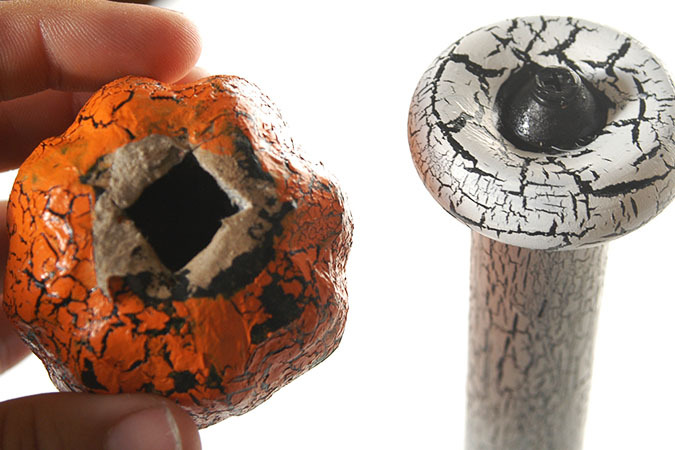 Drill a hole into either end of your dowel rod, and into the center of your base. Insert one screw up through the bottom side of the base and into dowel rod. Tighten screw so the dowel rod is nice and secure to the base. This will not need to come off again, so I suggest adding glue into the hole with screw to help keep it secure. 2. Now you want to insert the second screw through the hole in the wooden wheel. Add a bit of glue near the top and hold until dry and the screw is secured in place. 3. 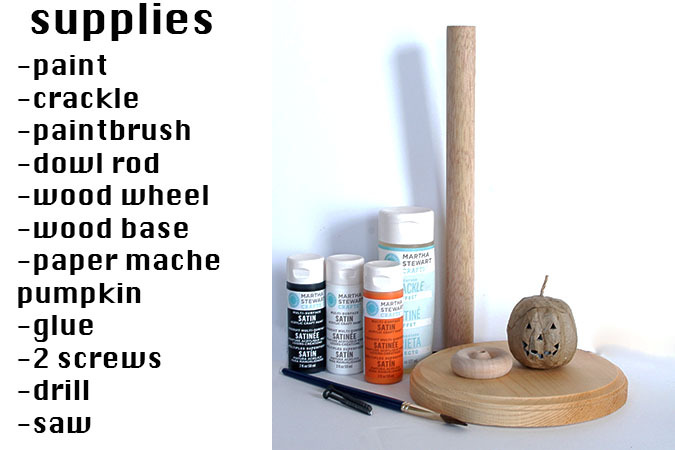 Paint the wooden wheel, paper towel holder, and pumpkin black, and allow to dry. 4. Once dry brush a layer of crackle onto all three pieces, a generous layer with as few brush strokes as possible. Let dry completely. 5. Now for the most exciting part, brush on your paint layer. 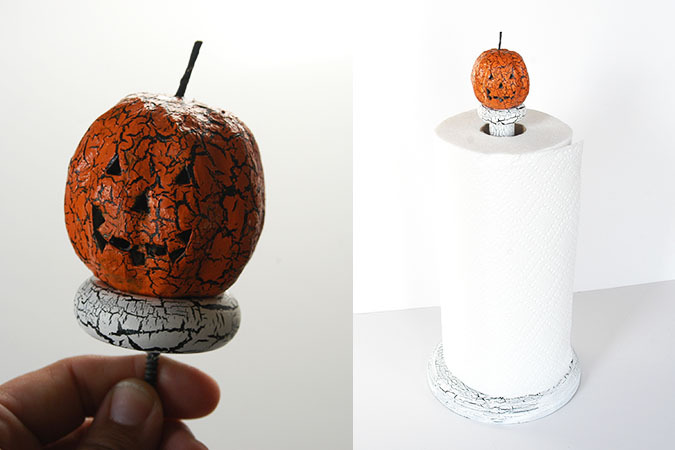 For the paper towel holder and wheel I used white, and for the pumpkin orange. As the layer of paint dries you will see the cracks appear. Allow these to dry fully. Then if you want to add an extra layer of protection against wear you can coat all the pieces with a clear coat spray. If you do this allow it to dry overnight. 6. 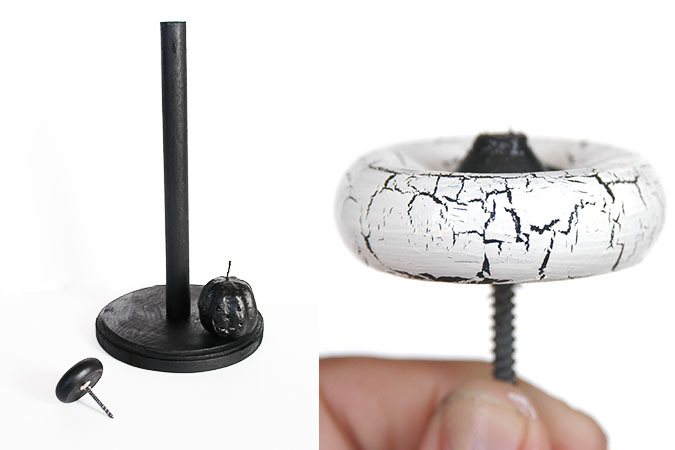 Once dry cut a small hole in the bottom of your pumpkin, so it can be glued to the top of the wheel. 7. Once all the glue and paints are dry you can use your paper towel holder. The top screw slides down into the hole in the dowel rod and does not need to be tightened. 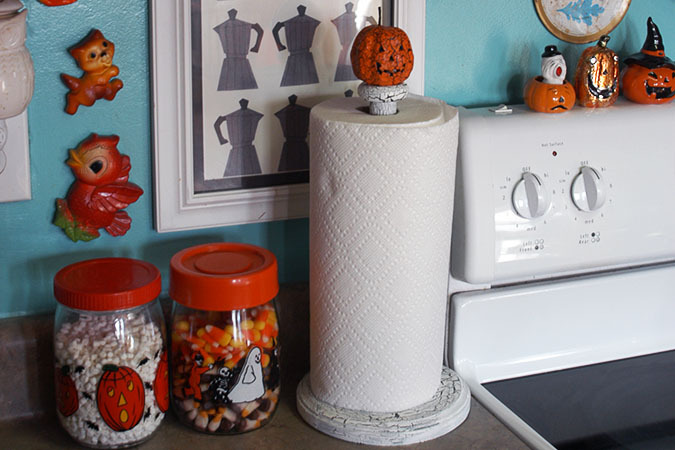 It stays in place and then you simple pull up your pumpkin when you want to change the roll.